I-684 to I-84 is the favorite way for people to get from NYC to Boston (via I-90) and vice versa. Personally I find CT 8 more enjoyable, and CT 15 more direct. Up for debate is whether or not the Saw Mill River Parkway is a shortcut for I-684 to I-287; it's a shorter distance, but lower speed limit, much lower design speed, and has a few traffic lights. 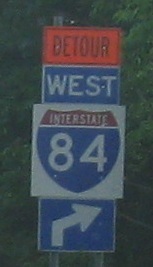 The southernmost BGS on I-684 (coming northward from the Hutchinson River Parkway), even though this branch isn't technically the mainline. It was constructed as such, though. 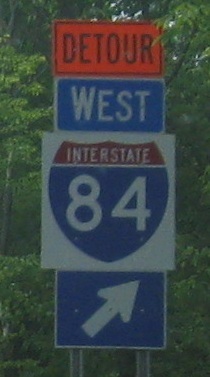 To differentiate it from the actual I-684, this leg is reference route 984J, but the mile marker conflates the two into a unique shield. At the southern end of I-684, the mainline continues on into the Hutch, since that was built first. When the Cross Westchester, aka I-287, was pushed through, a short spur was built out that way, because a joint Hutch/I-684 interchange would have been difficult to construct, not to mention out of the way for the NJ-CT traffic using I-287 to I-684 (and trucks shouldn't technically use the Hutch at all). The WB I-287 shield hasn't been replaced in this Doug Kerr photo. If one takes the I-287 spur, and then the ramp to I-287 WB, there is one final split, for the frontage road (Westchester Ave.) versus the mainline freeway, and it's in button copy. 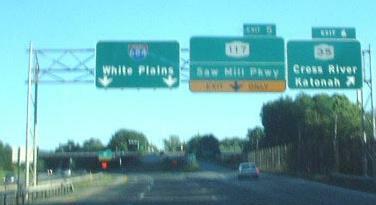 First photo courtesy Doug Kerr; both SB (there is no NB Exit 5). This would be the Saw Mill River Parkway, but words like River and State are frequently dropped on NYSDOT signage, and in common parlance this would be "the Saw Mill". 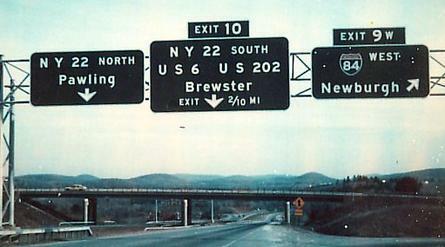 Exit tabs were not original equipment on I-684 BGS's, so some never got them, but the BGS I took did get a nice large NY 117 shield on top (freeway-size); NY 117 follows the Saw Mill for its northern mile or two, immediately adjacent to the Parkway. 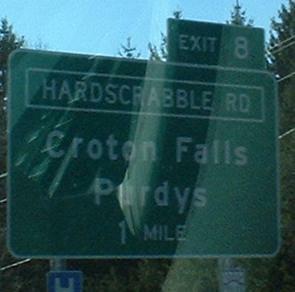 Side comment: NY 117 : Saw Mill :: NY 22 : I-684. At points, each of these pairs is adjacent and parallel - freeway, fence, two-lane road. Follow the link at bottom to more Saw Mill River Parkway photos. Back to SB, starting just south of the very beginning of I-684 from NY 22 SB (visit that page for the very beginning, link below). 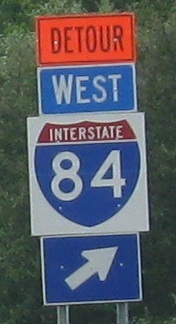 Street names on BGS's along I-684 are all caps and are placed in darker green boxes, probably to distinguish them from the control cities beneath them. The use of the box is a regional thing - NYSDOT Regions each have their own peculiarities. The previous generation of signage, with centered exit tabs and non-reflective sheeting, taken in 1977 by Michael Summa. See how much clearer it is to have three shields instead of a bunch of text? For a time in 2010, the SB direct exit to I-84 WB was closed, so traffic had to detour via the other sides of the interchange (using the loop ramps). It only works because the one missing loop ramp is WB-SB, which is the one not needed. The first two signs are SB at Exit 9E and the last two signs are NB at Exit 9W, the first and third ramps in the progression. I did save you a sign on I-84 EB between the loop ramps to whet your appetite on that page.